Have you been to Japan a few times already? If so, we’re sure that you’ve visited Kyoto and Osaka. Those cities are lively and stimulating, but would you like to see a different, quiet and relaxing side of Japan on your next visit? Would you enjoy a chance to meet the locals that live in rural areas, get to know them, and try cooking and eating dishes made with locally-sourced ingredients? We would like to offer some fresh ideas, and travel plans that you may not have considered. We are a government-based rural tourism organization that can help you plan off-the-beaten-track tours in Japan’s Nara and Mie Prefectures. 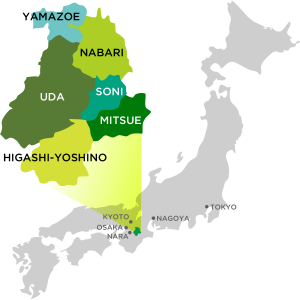 The area we cover lies across the borders of Nara and Mie: Nabari City, Uda City, Mitsue Village, Soni Village, Yamazoe Village, and Higashiyoshino Village. We call this region East Nara Nabari, or ENN. We arrange cultural experience programs like the following, as well as provide information about the region on this website. Cultural programs such as “Kumihimo” Iga braiding workshops, and “Kyogen” (traditional Japanese comic theater) experiences. *More program information and reviews will be posted soon.